Stepping into the spotlight, in early 2017, the Citroën C3 Aircross stole the limelight in the world of SUVs with its fresh, powerful and original attitude. The integration of robust strength and Citroën's Advanced Comfort® programme reflects Citroën's DNA and the fundamentals of SUV design. Discover the endless possibilities, with 85 colour combinations available! With eight body colours, three roof colours and four Colour Packs, the Citroën C3 Aircross adapts to your personal style preferences. The customisation concept extends to every detail: the quarterlights with their shutter effect and the roof bars, coloured door mirrors, headlamp surrounds and wheel centre caps. 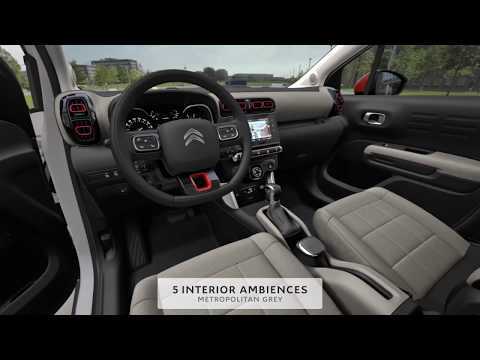 The cabin can also be customised with a choice of 5 distinctive interior ambiences. The car layout is exceptionally spacious with 5 seats with generous leg and head room as well as a 410L capacity boot space, which can be increased to 520L through folding the seats. A wide range of new-generation efficient, economical engines combine advanced technology.This SUV is available with a PureTech petrol engine (82, 110 and 130) or BlueHDi diesel engine (100 and 120). With Raised clearance, large wheels, Grip Control with Hill Descent Assist and Park Assist technology, the C3 Aircross makes everyday life, and driving, easier in both the city and the open road. Stay connected, entertained and on track with wireless smartphone charging and access your smartphone apps through 7" touch screen through the Mirror Screen function, with Apple CarPlay and Android Auto. 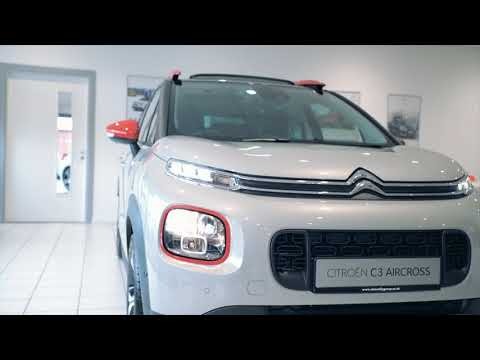 The compact SUV benefits from the Citroën Advanced Comfort® programme and is equipped with intuitive technologies, grouped at the centre of the dashboard on the touchscreen, to ensure your safety at the wheel and give you an added peace of mind.The park assist, intelligent beam headlights, traffic sign recognition and active safety break features ensure the C3 Aircross drives at ease on any terrain.